Barge Transportation has witnessed moderate growth over the past decade across the globe. However, with the industrial growth and advancements in the manufacturing of a wide range of Barge Transportation which are both versatile and fascinating leads to increase the sales of Barge Transportation across the globe. Barge Transportation is considered one of the major segment of marine transportation. A significant evolution of Barge Transportation in recent years has provided a feasible amplification to the variety of services, thereby driving developments in the Barge Transportation industry. Furthermore, specific features and properties and require competencies within the manufacturing technology are likely to provide growth opportunities to Barge Transportation. The import-export of crude oil and petrochemical is extensively depended upon marine transportation, and increasing demand for oil & petroleum products strengthen the trade, results in the growth of barge transportation market. The strong interconnectivity of canal and rivers across the countries and regions will fuel the business and will lead to an increases demand for petrochemical transportation. As a result, could boost the manufacturing of Tank Barges. Advantages of barges transportation in terms of emissions, fuel usage and capacity compare to railcars and trucks are the key factors deriving the growth of barge transportation market in the near future. The rising consumption of North American oil is escalating lot of barges, as several petrochemical and energy companies mainly turn to the canal, coastal and rivers waterways to get North American crude to refineries in U.S. and Canada and will increase the usage of liquid cargo barge over the forecast period. With expanding petrochemical industry rise the shipments across the regions. The expanding usage of inland waterways in the transportation of chemical, agricultural and farms products will further propel the growth of barge transportation market. With increasing seaborne trade, demand for the development of new port and continuous maintenance of the existing one is expanding. As the port management becoming complex and robust, federal governments are looking for port privatization. For instance, the national governments of the USA and Canada are facing the problem with the trade surge. As a result, policies are being formed regarding port developments under private organizations leads to the building of new ports which will increase the trade and cater to the growth of barge transportation market. During the past few years, ocean freight has witnessed a positive growth in SEA and Western Europe countries. Counties in this region have large logistical operations. These logistical operations need large vessel for inland, offshore and ocean transportation. This creates potential demand for barge transportation across the globe. Moreover, mandatory government regulations are also contributing to the growth of the marine electronics market. Many companies are establishing their foundries in Western Europe, China and Japan. With the growth of ocean logistical operations, the marine electronics market is witnessing a potential demand, and is expected to grow with the growth of logistics demand during the forecast period. The increasing price pressure is one of the prominent factors for the consolidation of the transportation sector. The trend of getting larger fleets will prevail over the forecast period in the Middle East and North Africa barge transportation market. In the Middle East and Africa Market, the number of potential consumers is declining, and the purchasing power of the prominent players is increasing at a good pace. The market for the barge transportation in the MEA region will face stiff competition between the global market participants for gaining higher market share. The concept of sharing and renting leads to increases the barge transportation in the Middle East and North Africa market at significant rate, and it is projected to remain popular throughout the forecast period. With the growth in construction aggregates and coal market. The construction aggregates such as sand, gravel, crushed stone, slag, recycled concrete, iron ore, cement, etc. required a large and efficient mode of transportation leads to benefits the barge transportation services. Governments of major economies are focusing on the development of transportation facilities and strengthening energy (power generation) infrastructure, leads to drive the growth of barge transportation market due to its large capacity and cost-efficient. On the basis of region, Barge Transportation market is segmented into North America, Latin America, Europe, Japan, APEJ and MEA. The Barge Transportation market is segmented on the basis of barge type, vessel type, voyage and propulsion. On the basis of barge type, Barge Transportation market is segmented into dry bulk cargo barge, liquid cargo barge, car-float barge, power barge and construction barge. By vessel type, the Barge Transportation market is segmented into the open barge, covered barge and tank barge. By voyage, Barge Transportation are segmented into the inland, offshore and ocean. By propulsion, Barge Transportation are further classified into towed barge and self-propelled barge. 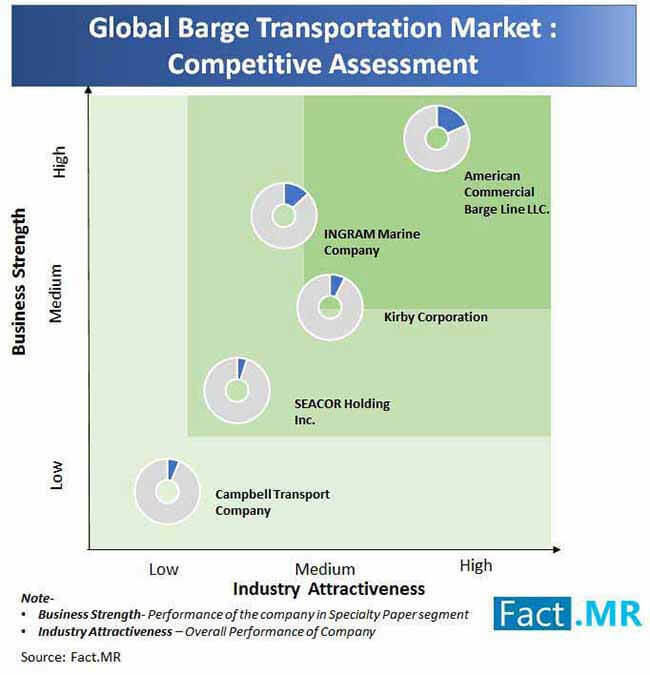 However, the report by Fact.MR distinguishes vendors in the global Barge Transportation market among three key groups subjected to their regional concentration and focuses on the Barge Transportation market. Key players in the Barge Transportation market which broadly concentrates on Barge Transportation and has business and sales footprint across the world. The companies such as American Commercial Barge Line LLC., INGRAM Marine Group, Kirby Corporation, SEACOR Holdings Inc., Campbell Transport Company, Heartland Barge, Bouchard Transportation, Canal Barge, Magnolia Marine Transport, Marquette Transportation among others key companies exhibit top position in the global market for Barge Transportation. The tier I manufacturing companies in Barge Transportation segments, however, account for the significant share of the global Barge Transportation business and the tier II players in the global Barge Transportation market is regional operators, which are primarily based out of the US and Europe, and predominantly are Chinese companies.